After slowly exhausting good road infrastructure states in India, we were forced to look outside our comfort zone and we decided to give Uttarakhand a shot to kick start our 2014 travel season. As this place has more dangerous curves than an average Miss Universe contest and one solitary curve is all it takes for Pranav to make a mess of his surroundings, we had to find someone foolhardy enough to babysit him while we hopped around the mountains. Grandparents fit the foolhardy bill perfectly and Aparna’s parents were in fact more than delighted to take care of Pranav while my parents joined us for the trip. After surviving the pressurised belly of an aeroplane and a series of remarkably tasteless affairs on the Shatabdi, we reached Haridwar, the city where the Ganga meets the plains of India. The chic thing to do here is to get on the state of the art cable-cars systems in the pretext of visiting a couple of hill-top temples. After doing the chic, we did the must-do, the famous Ganga-Aarti of Haridwar. At around sunset, scores of pandits do the “Aarti” or the ritual fire-worship of the Ganga and multitude of devout Hindus join them in the thanking and praying to the river. Moving experience nevertheless, I wasn’t sure what all the thanking and the praying were for. I don’t know if humans have freewill or not. Rivers certainly don't. The following morning, we did the obligatory visit to the Lakshman-Jhula, the most iconic suspension bridge of the nation, in the nearby city of Rishikesh. After that we continued on a bone-jarring excuse of a road past some of the most scenic views this planet can offer, past five “prayag”s or confluences where some of the famous rivers of the nation add their bit to the Ganga, to a remote village called Joshimath. 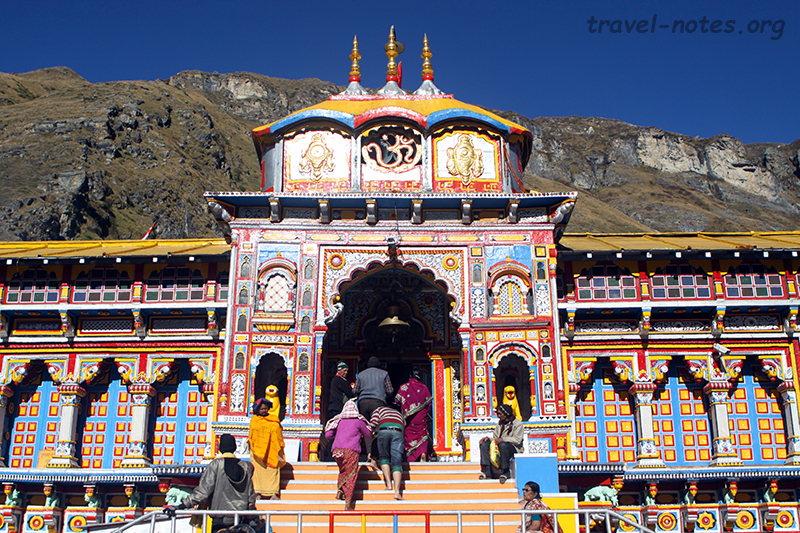 Joshimath is the last major town before Badrinath, one of the holiest Hindu temples, attracting hordes of ardent devotees every year. Early next morning, we made a beeline to the temple which, to our pleasant surprise, was pretty uncrowded. Our only challenge was to locate the idol which was very well concealed inside a mountain of ornaments and floral decorations. We also made a quick in-and-out of Mana, which if not for the fact that it is the last Indian village (presumably in a given direction), would have attracted no one, before jostling back to Joshimath. Joshimath actually comes from Jothir-math, first of the four important “math”s that Adi Sankara established across the country. These “math”s are the primary reason why India is predominantly Hindu and not Buddhist like most of the far-east. The “math” really looked sad, lonely and deserted and I don’t know how it managed to drive out even a fly, let alone well established and well-funded religions. 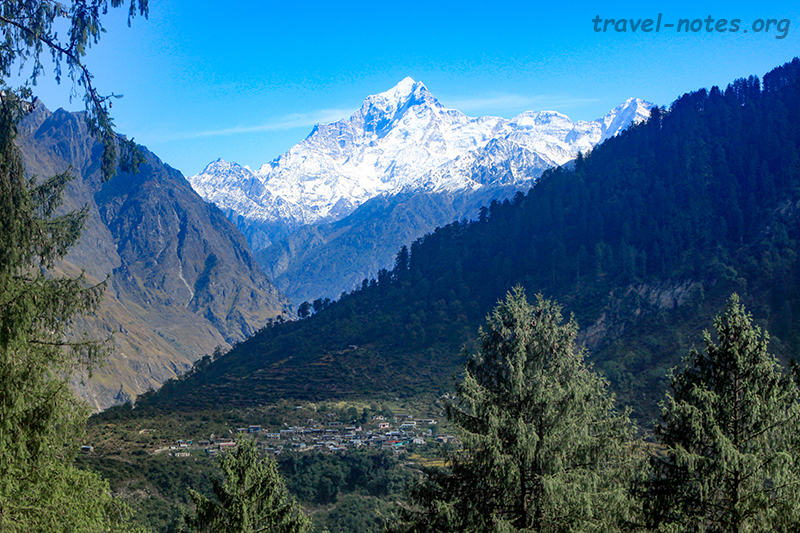 Auli, the hill behind Joshimath, the local ski-resort and boasting Asia’s longest cable-car, is still worth visiting even in summer when it is not quite white for skiing. 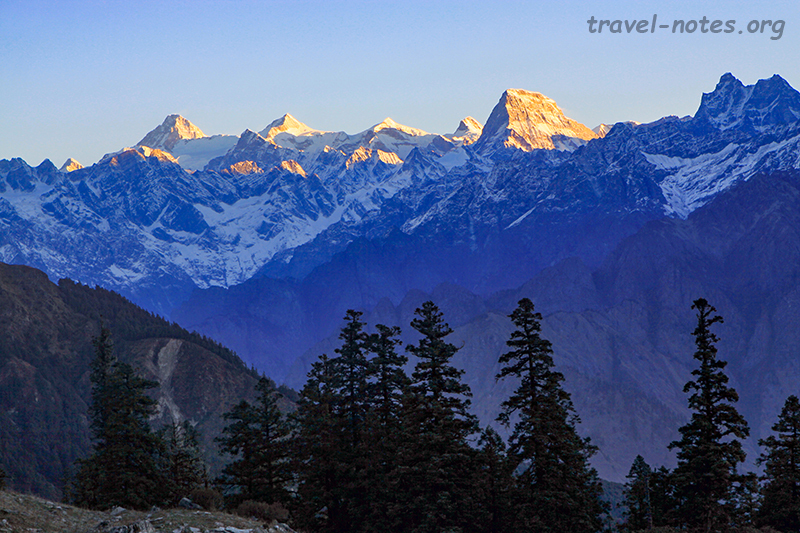 The reason is that, from here, you can catch more than a glimpse of Nanda Devi (7816 m), the tallest peak in the country. Well, it is the second tallest, if you count the muggle (half-Indian, half-Nepali), Kangchenjunga, as “Indian”. 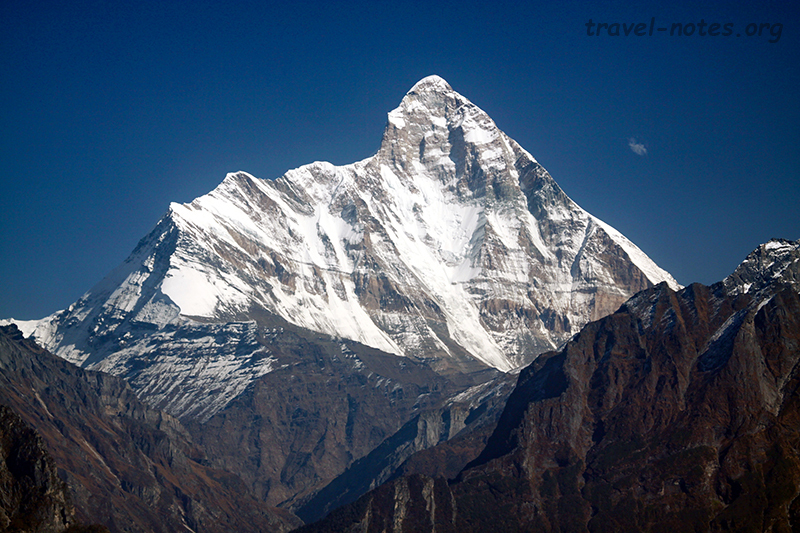 It is also the undisputed 23rd highest peak in the world, mostly because no one gives a rodent’s behind beyond bronze. Regardless of the medal standings, it is absolutely majestic watch on a clear spotless day like the one we were lucky enough to enjoy. The trip, which so far has resembled a Hindu pilgrimage, was about change shortly. After bidding adieu to my family, I started the primary purpose of the whole exercise – a solo trek across to the Kuari Pass. Well, by “solo” I mean it was me, a guide, a cook, a battalion of unruly mules and a mule-man to keep the said battalion a bit ruly. Kuari pass is deemed as a scenic stroll and the best hike in the nation to kick start a trekking lifestyle or take your body on a test-walk. I hadn’t seen the inside of a tent in a decade and spent most of that decade stuffing myself with pizzas whenever I was running out of pakoras. Why I expected me to be in anything but the worst shape of life, can only be explained as a glorious triumph of hope over reason. To make the matter worse, hurricane Hud-Hud, now weakened to a piss, decided to do the same trek on the same day. My good friend, Fido, had suggested me to carry an umbrella on the trek. That sounded so laughably inane that I took it without questioning and that alone was the reason why I could end the first day with some semblance of will to carry on. Hud-Hud kept me huddled inside my sleeping bag all of the second day and on the third, it thankfully had enough of the trek and left to rain on some other party. While the best I can do to a place to keep my litter to the minimum, a hurricane can actually leave the place prettier. When Hud-Hud left, it left a fine dust of snow on all the peaks, making the whole place positively enchanting. Undeterred by a mighty altitude sickness (no, a decade of dosas and samosas do nothing to your susceptibility to altitude sickness either), I pressed on to the local maxima of ~3600m to enjoy a 360 degree view of snow covered Himalayan peaks. All through the time on the top, and all through a brutal day long descent, I had a lump in my throat realising that I am probably walking my last high alpine trek. I think I have slowly give up my dream of “doing” the Goecha-La, the Snowman, the W, the EBC… if you don’t know what these are, do yourself a favour and resist the temptation to Google them. I have to carry the disappointment of missing out on these to my grave. You don’t. That would have been the perfect spot to stop this journal. But I would be dishonest if I did that. On the multi-day trundle back home, I happen to spend one of the evenings at a South Indian restaurant in Haridwar. When my eagerly awaited Masala-Dosa arrived, I was shocked to find copious amount of paneer in my “masala”. That somehow managed to end up as my greatest disappointment of the trip. 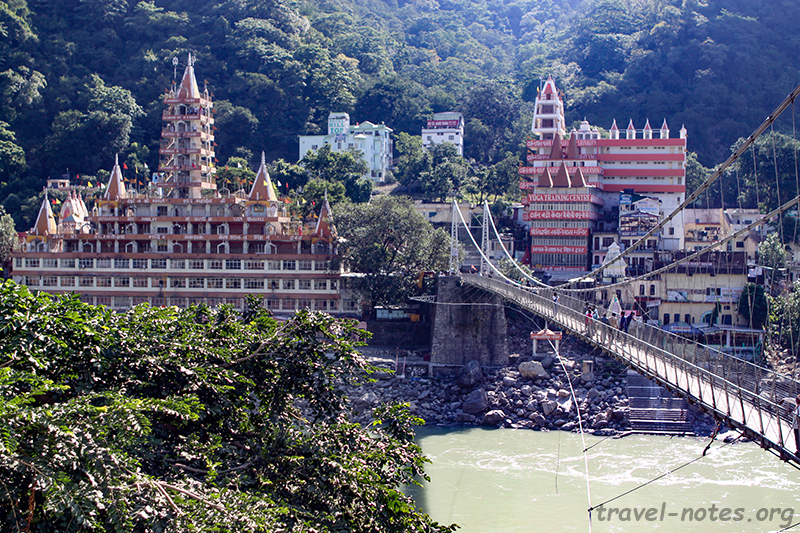 It is said that Haridwar-Rishikesh corridor is the place where one finds one’s true inner calling. I did find mine. Kinabalu can be climbed in a parallel universe. But, this one must be rid of all its clueless cooks. Click here for more photos from Uttarakhand.